The story behind the name: Two circumstances lie behind the multitude of myths associated with Draco. 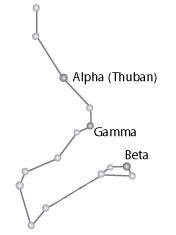 First, due to the precession of the Earth, Draco's star Thuban was the pole star approximately 4000 years ago. It would have seemed to ancient sky watchers that the Earth revolved around Draco. Second, dragons and other large, powerful creatures were frequently associated with early creation myths. In many stories, the gods had terrible battles with monsters which they destroyed and flung into the skies, from whom they ripped control of the Earth, or from whose remains or corpse the Earth was born. One such myth was the Babylonian creation story of Tiamat who turned herself into a dragon, but was defeated and split into two, one half becoming the heavens, the other half the Earth. A very early Greek creation myth shows the influences of this story. In a Norse creation myth, a dragon gnaws at the roots of Ygdrasil, the tree that covers the world. The Egyptians saw Draco as a hippopotamus or crocodile, representing gods and goddesses who appeared in the forms of those animals. Greek and Roman mythology have many legends about dragons and serpents, but two especially are connected with Draco. One story is Zeus's battle against his father, the Titan Cronus. It had been prophesied that one of his own sons would dethrone him, so each time his wife Rhea bore a child, Cronus swallowed it. Rhea hid the infant Zeus and tricked Cronus into swallowing a stone. He uncovered the trick and went after Zeus who escaped by turning himself into a serpent and his nurses into bears. The constellations Draco and Ursa Major and Minor commemorate his escape. Another legend is the eleventh labor of Hercules. Hercules was asked to obtain fruit from the golden apple tree, a wedding gift from Gaia, that was planted in Hera's garden and guarded by the dragon Ladon. In accomplishing the task, Hercules killed the dragon. Hera wept for Ladon and set his image in the stars.